Background: We had great desire to establish a welfare organization of our own. My family including my sisters and brothers donate to various welfare schemes individually. The individuals effortlessly produced the desired results. But the desire was there to have our own setup. Almighty Allah was very kind, we found an existing setup named as "Mudersa Rehmatul Alameen" situated in a small house in Korangi Town, with 100 to 110 children learning Quran from Qari Saifullah. The founder of the Mudersa has died and the setup was in a disorganized shape, with no control and financial standing. Qari Saifullah was also having difficulty to run it without any sponsor and financial support. I, Engr. Col Javed Majid, offered Qari Saifullah that with his cooperation and our financial support the setup can be made an effective organization and can be expanded in multi-directions, which he agreed willingly. The existing setup is then streamlined. The house where it is situated, though a small one, is renovated. Following additional fields are then added gradually. Teaching of Quran in two shifts. Renaming: Due to multidimensional role and functions of the organization, it has been renamed as "Rehmat-ul-Alameen Welfare Organization" and finally it has been brought under the umbrella of NED-SET (NEDian Social Engineers Trust) with the help and cooperation of Engr. Iqbal Ahmed Khan and Engr.Badaruddin Khan for recognition all over the world. Now it will be known as “NED-SET Rehmat-ul-Alameen Welfare Organization". The functions are elaborated in the succeeding paragraphs. Learning of Quran: Initially the children were learning Quran only during the afternoon session. A lady teacher was already performing this duty. The pay of the lady teacher was increased and she was asked to also run the morning session. This helped those students who were studying in the afternoon shift of the schools; hence there were a considerable increase in students. The teaching is being carried out free of cost. Stitching School: There were about 75 girls of various ages who were learning the Quran; to benefit the elder ones, a stitching classes were organized. Two lady teachers having experience in stitching were employed and 13 good quality stitching machines were purchased, thus the stitching classes were started in the afternoon from 2 pm to 5 pm. The other stitching schools in Korangi are charging Rs 700 to Rs 1000 per month, whereas we have kept the fee as low as Rs 100 per month. At present, we have more than 45 students. The school is functional for the last two years. In this period, quite a number of girls have learnt stitching and have started stitching as business in their homes. The stitching machines have been provided to them on settlements from the Micro financing setup which is also run by the Rehmat-ul-Alameen Welfare Organization. The school is still not financially able, an input of Rs. 6000 per month is required to maintain it. Micro Financing Setup: There are many people who have the technical know-how or the capacity to earn independently but lacks the financial resources. Such like people are our targets. To facilitate such people a micro-finance facility was established in December 2013. It was the first experience of its kind to us and it proved to be great success. The beneficiaries are very poor people men and women alike. They were stagnant or held up in their lives, how to earn? They could see the opportunities but could not avail them due to lack of finances. Micro-finance setup provided the small amount needed by them without any interest or extra charges to earn more to meet their monthly expenditures. This also provided a jumping pad to enhance their income or business. For interest sake few examples are enumerated below. Small Shops by Women: House wives who could not go out due to their small children or could not do any job but were forced to support their homes, took loans from Rs. 5000 to Rs. 6000 to open small shop on a mat spread at their door step. The women who were already working on these lines and the new entrant were equally benefited with this scheme. The pay back was 100% and usually Rs 500 per month. Loans for Carts: Selling Vegetables, Fruits, Second Hand Clothing, and Small Articles on Thailas. (Hand Push Carts). Loans for such types of works were taken by men who have the family to support and have the know how of selling such things, they usually took Rs. 10,000 and returned it at Rs 1000 to Rs 1500 per month. They returned the loan easily and at the same time were able to support their family. Usually the entire family took part in preparation of the Thaila in the morning. Loans for Equipment Capital: The third type of people who took the loans were the persons who were working for others and did not have the capital to work independently, the income was shared half and half. For example, a woman was stitching Motor Bike seats using a special type of machine, which has a cost of Rs 15000. The women did not have the money to purchase the machine of her own. She was earning Rs 300 to Rs 400 daily but half of it was taken by the owner of the machine. She took a loan of Rs 15000 from micro financing, purchased the machine of her own and returned the loan in just five months. Loans for Small Business: Similarly, a man was selling sun glasses on shoulder mounted board in Saddar Area. The total capital involved was Rs. 6000 only. He was selling these glasses for someone else and paying him Rs. 150 daily, half of his earning. He took Rs. 6000 from micro-finance started his own setup and returned the loan in two months. Loans for Sewing Machines: Women who learnt sewing and were confident enough, but did not have the resources to purchase a Sewing Machine, in that case a good quality machine was provided to them at a cost of Rs. 5000 and the money was paid back at Rs. 500 per month. Loans to Pay Off Debt: A man took a loan of Rs 100,000 from a professional Money Lender, who charged him Rs. 5000 per month in addition to the payment of capital amount. For last 10 months, because of his poverty he was only managing to pay Rs. 5000/ pm, the capital was as it is and would have remain as it is since he could not pay more. The man contacted us got loan of Rs. 100,000/ from micro-financing account. Paid to the Money Lender and now paying Rs. 5000 monthly installment to micro-finance scheme, will be able to pay off his entire amount in next few months. At present we have more than 80 persons on our list of beneficiaries, who are still paying back the installments or cleared their loans. There are always 5 to 6 persons on waiting. A total capital of approximately Rs 6 hundred thousand is in circulation. 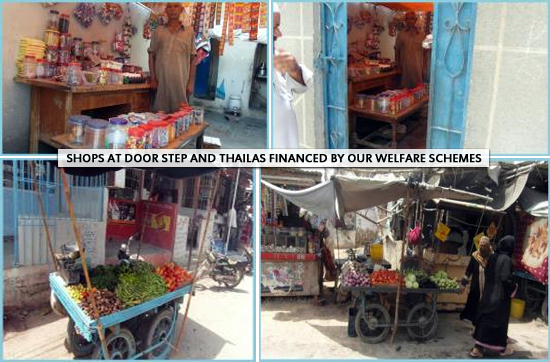 Welfare Scheme: Under this scheme, welfare of the families are covered. Educational Support: There are poor families with 3 to 4 school age children who cannot afford to purchase the books for them. Usually, the cost of one set of books for each class ranges between Rs 1200 to Rs 1600 depending on the level. A person with 3 to 4 school going children will need Rs 4000 to Rs 6000. for the books only; it will be an uphill task for him to meet this demand. In such a case, a survey was conducted and the poor families were identified. The persons were asked to deposit Rs 200 per child as token money and get the complete set of books worth Rs 1200 to Rs 1600 per child. The schools Book Shops were taken into confidence; they gave a discount of 15% on each set of books. Similarly, children of Government Schools were provided books by the Govt. free of cost but were required to purchase eight copies per child at Rs 40 per copy. The deserving families were asked to deposit cost of one copy as a token and in return get eight copies. A discount of 25% was also given by the Book Sellers. Under the Books support program this year about 55 students were benefited at a cost of Rs. 55,000. But due to financial constrains more students could not been accommodated. Monthly Ration Support program has also been started under the Welfare Scheme, in which selected families gets monthly ration for an amount of Rs 5000 from the grocery shops in the vicinity which were taken into confidence and they agreed to provide 20% discount on rations. Only ration is issued from the shops, no cash is given. Rs 30,000 per month are required to meet these expenses. It also has the limitation of financial constraints. Clothes for Eid: It has been decided to provide new cloths to each student. There are about 170 girls and boys enlisted for new dresses. Cloth for the girls and boys have been purchased in bulk and handed over for preparation of dresses at Stitching School by the teachers and the students. That will be more economical and at the same time the students will get ample opportunity to perfect their stitching skills. The whole program itself is a costly affair to a tune Rs 1,50,000; therefore, the shoes cannot be added due to financial limitations. Presently, the institute is operated during the afternoons from 2-6pm. The fee structure of other computer institutes in Korangi are from Rs. 1500 to Rs. 3000 per course for 3 months duration, whereas, we are charging Rs. 250 per month per course. Our aim is to prepare the girls and boys to such a level from where they can get a job in the market. The initial investment was about Rs 200,000. for purchase of 10x computers, furniture cost and setting, electric board connection and 5 KVA generator as stand by power. The monthly expenditures are nearly Rs 18000, which include, the pay of staff, rent of building, electric bill and fuel charges of generator whereas the monthly income is between Rs 6000/ to Rs 8000. Presently it is not self-sustaining. It is being functional for the last one year. Conclusion: The welfare of a society has unlimited dimensions and scopes with unending expenditures. As a first step an organization has been formed, from where a wide range of welfare schemes can be launched. The scope and extent can be enhanced with the increase in the resources. Presently with collective efforts in an organized manner with meager resources, some positive results have been achieved. Though on a wider screen, the present welfare work is negligible but still some positive contributions to the society have been made. Cooperation from everyone is expected to maintain the present level and also to enhance the welfare work to new heights. If you need any additional information or you want to participate in enhancing the program then please write to Engr. Iqbal Ahmed Khan on [email protected] or call him on +92-321-701-4929. Please read the Interview of Engr. Col. Javed Majid who is also the President of NED-SET and in-charge of running NED-SET Rehmat ul Alameen Welfare Organization. Just click the button below.